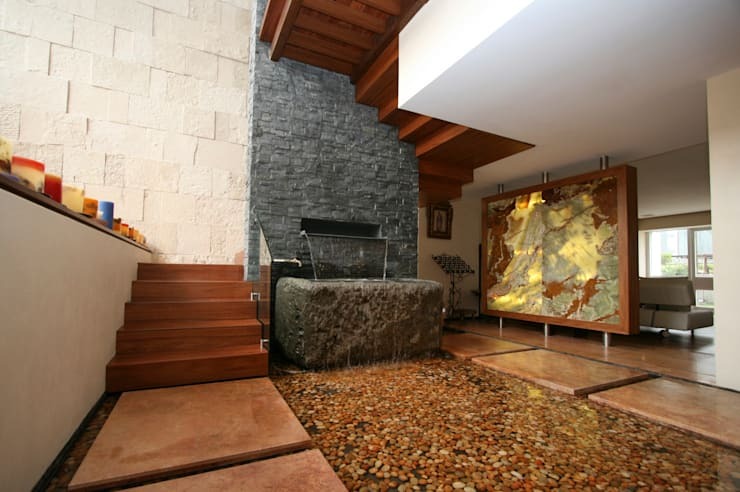 18 staircases with a stone and water garden - spectacular! 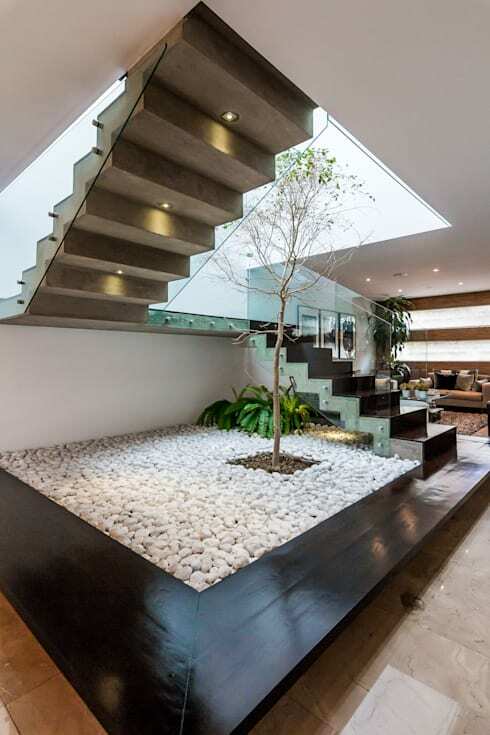 18 staircases with a stone and water garden—spectacular! 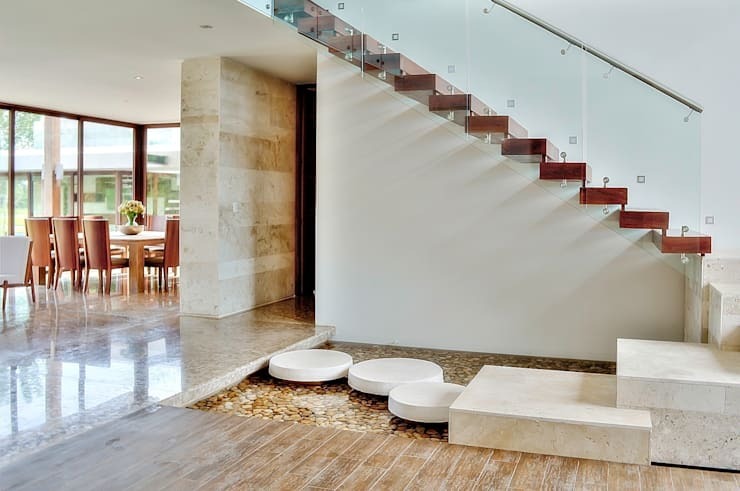 These days, stairs are more than just functional elements in our homes. These essential yet stylish accessories have become part of an abode’s overall design aesthetic, and should be treated accordingly. From luxurious statements to classic elegance, stairs can bind the theme of a room together or even maximise available space. So, in honour of the not-so-humble staircase, we've gathered 13 of our favourite creations which are bound to elevate your spirits! Let's get inspired. The indoor Zen garden here is built under the stairs, with the sky visible visible through the open spaces above. The stairs zig-zag with plenty of space between them, maintaining an open feel. This modern theme with its cosy linear fireplace has the right dose of straight-lined panache thanks to the wooden steps, stone bed and glass walls. 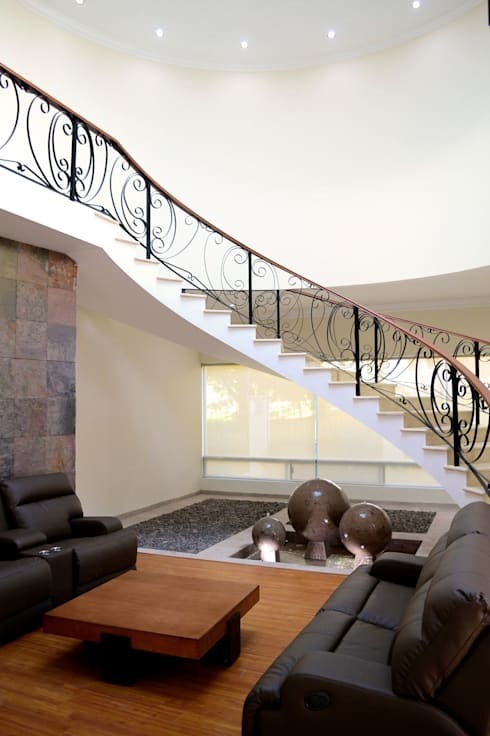 This modern space is done up with chic silvery-blue artwork, and has tall glass railings to flank the stone stairs. White rocks line the space below the stars and the view at the end makes for much greenery and sunlight. The modern-chic school of design with its abstract elements meets classic here, with beige stone hues and wooden finishes. 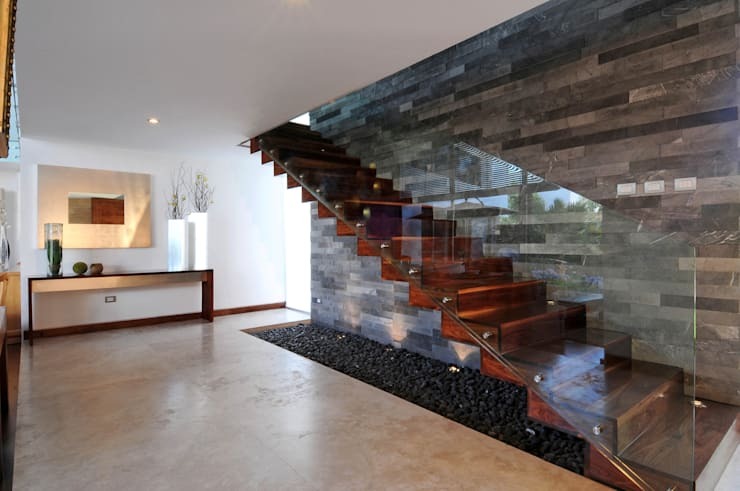 The staircase has clear glass railings which perfectly complement the stones below. 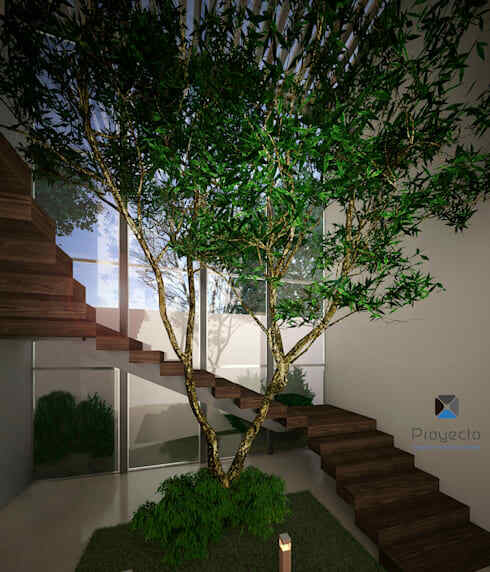 This staircase has a linear yet undulating rise which centres around the piece de resistance: a green courtyard and its towering indoor tree. 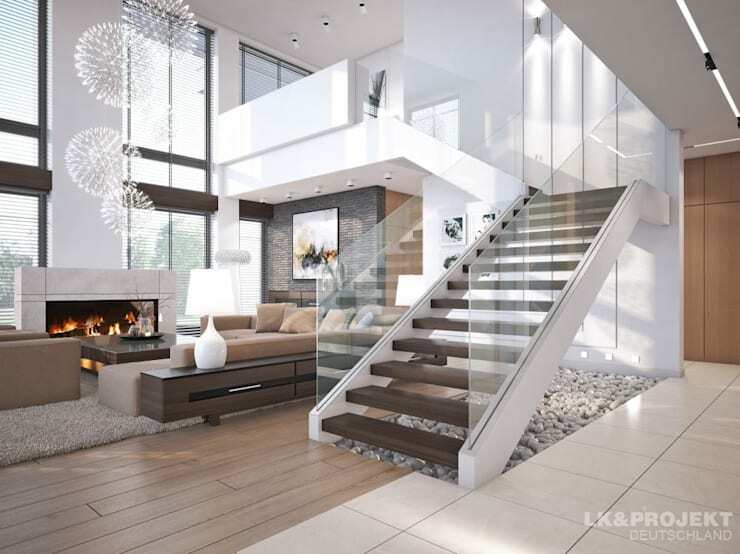 The loft look gets some measured elegance with this step-ladder staircase and glass ceiling. An indoor garden has been tucked underneath with plenty of fabulous lighting. The modern dramatic look comes alive here with a rich brown palette. 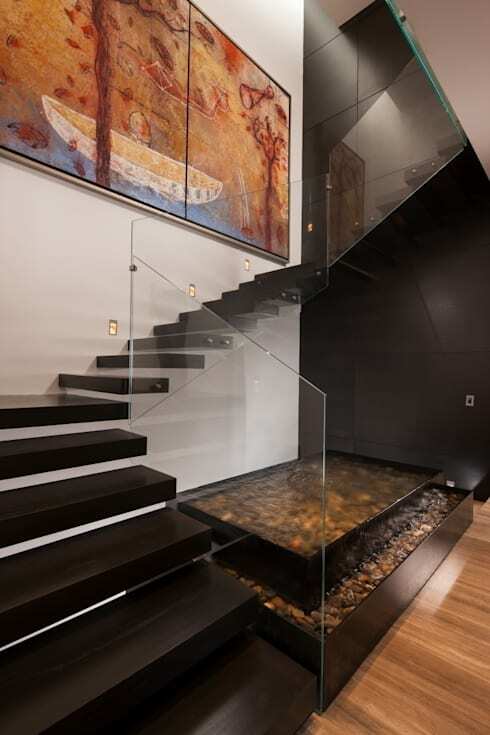 Bold, dark steps wind around layered trays holding stones and a pond, as subtle artwork adds colour to the sleek wooden space. 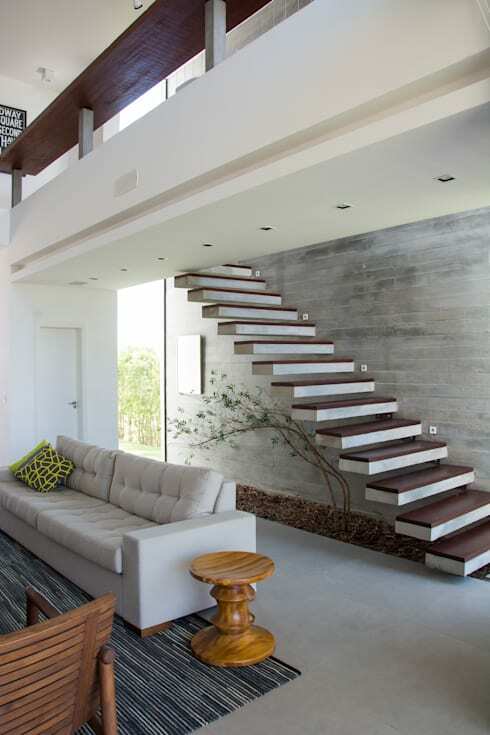 Here, slim steps against an exposed concrete wall make quite the statement in this elegant loft. 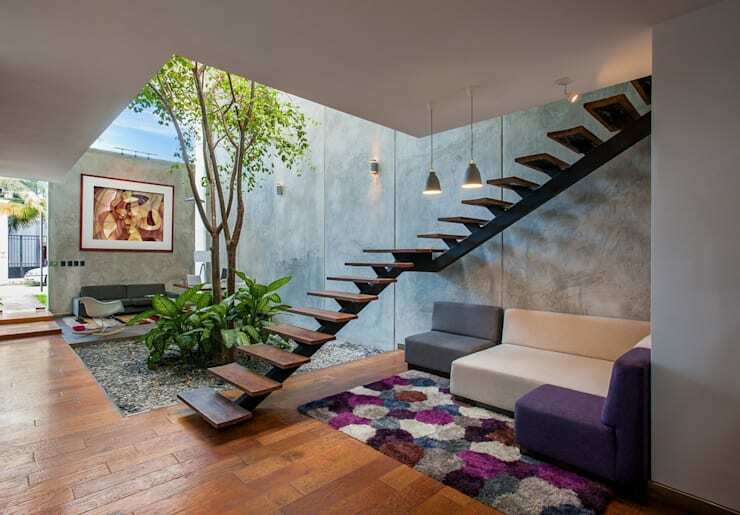 These simple wooden stairs create the perfect nook for some vibrant seating, while a beautiful patch of green adorns the other side. A simple stone base lines this area, enhancing the natural feel. 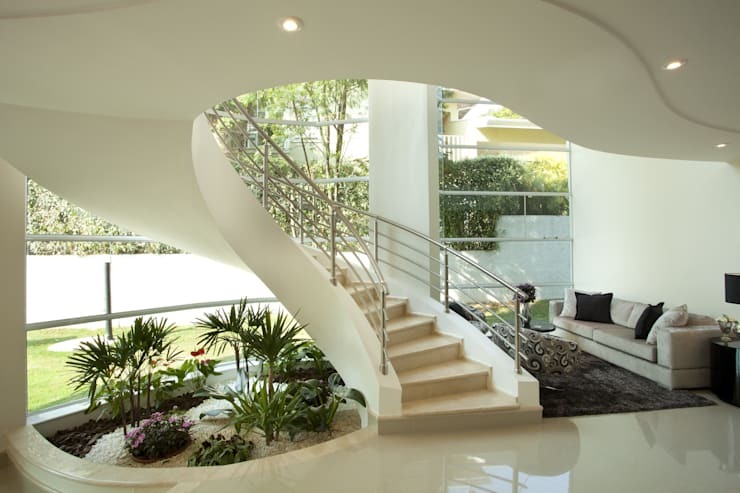 Here we see some wide, winding stairs centred around a lush little garden and elegant sculpture. The understated materials at play impart a smooth and relaxing aesthetic. 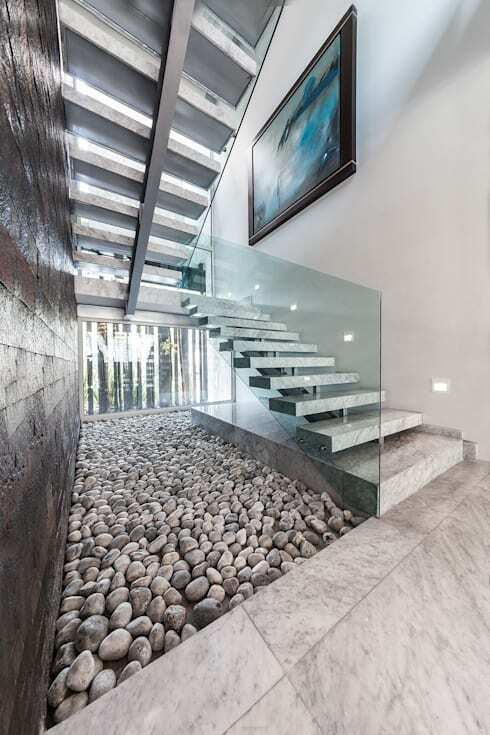 Volcanic rocks, wooden steps with a stone-tiled backdrop characterise this space beautifully. A subtle glass banister keeps things light and fresh. This modern home has an impressive rock wall with a rich palette of browns, greys and golds. 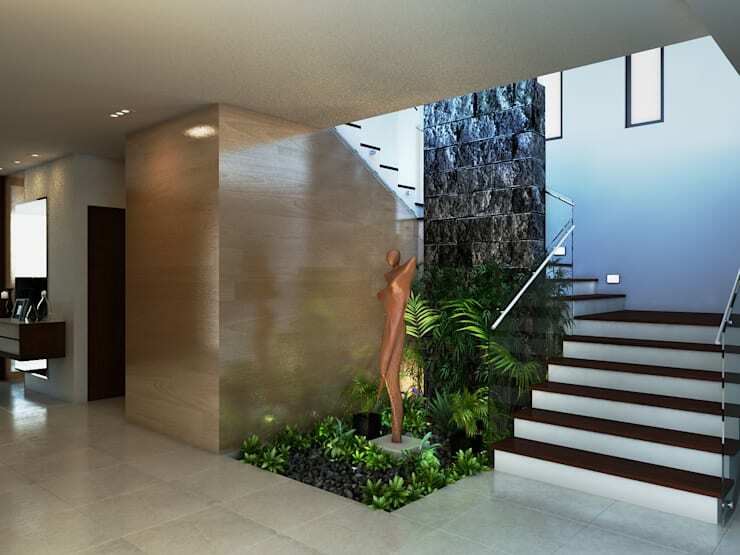 The stairs are visible from various corners for an interesting and contemporary rustic effect. 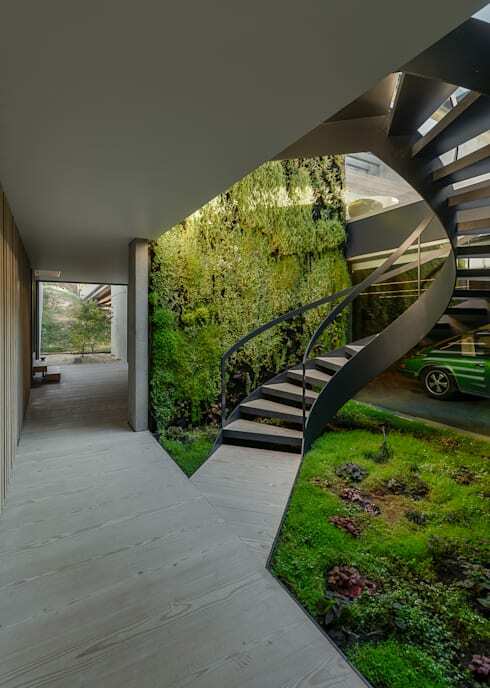 This impressive winding staircase is characterised by interior landscaping and walls of greenery. The classic spiral staircase has an almost cloud-like appeal here, with a living room on one side and green courtyard on the other. ​16. Lighting to the rescue! 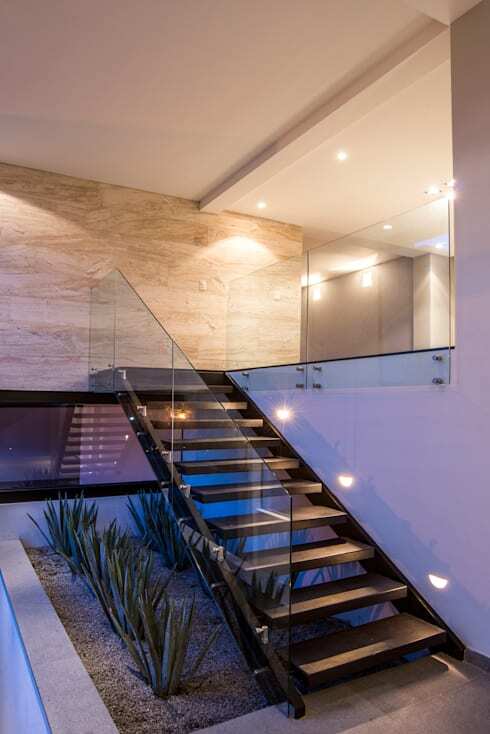 The subtle lighting of this home accentuates the texture of the sleek stairs, inviting you to climb them. A soothing rock bed completes the look. 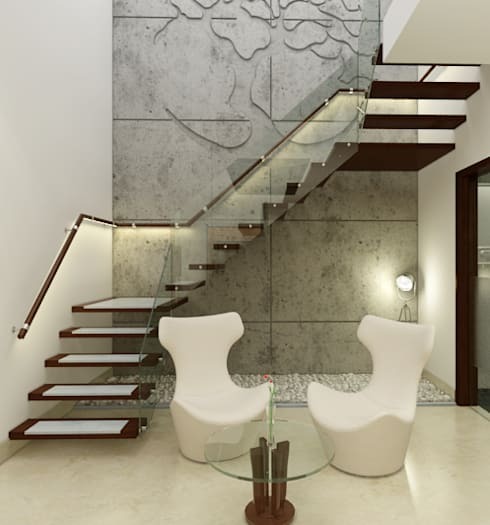 An intriguing stone wall panel and quirky chairs complement the art deco boldness of the steps here. The limited palette keeps things cohesive and cool. 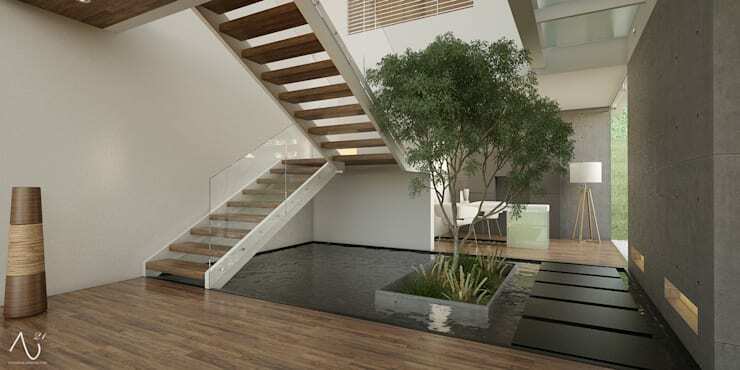 In our final example, a particularly soothing pool likes under modern stairs and a tall indoor tree. Simple wooden tones provide the perfect natural contrast. 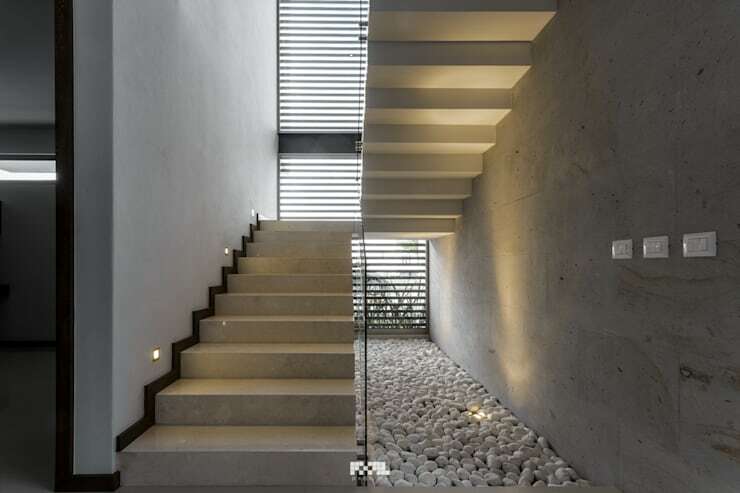 Which of these staircases would you choose?